With growing interest in the Fintech market, other related markets are being analyzed to see if technology can revolutionize business processes. One area which has been disrupted by technology is regulatory compliance, primarily within the financial services industry. The UK’s Financial Conduct Authority (FCA) was the first body in the world to recognize and support the growth of Regtech in 2015. However, prior to this, companies were already seeking to leverage technology to help with their increased regulatory burdens. Regtech is defined by the FCA as a subset of Fintech that focuses on technologies that may facilitate the delivery of regulatory requirements more efficiently and effectively than existing capabilities. The appeal of Regtech is that financial institutions can utilize new and disruptive technologies, such as Artificial Intelligence (AI), Big Data analytics, biometrics, blockchain or chatbots to reduce their overall spending on compliance by unlocking more efficient practices. According to the latest worldwide market study by Juniper Research, spending on Regtech platforms will exceed $115 billion by 2023 -- that's up from an estimated $18 billion in 2018. Moreover, increased regulatory pressures -- such as GDPR (General Data Protection Regulation) implementation -- are driving businesses towards Regtech to meet greater compliance challenges. According to the research, any heavily regulated business sector not prioritizing Regtech adoption would risk damaging government imposed fines from failing to keep pace with regulatory changes. The study also highlighted that the sharp increase in Regtech spending (an average of 45 percent per year between 2018 and 2023) was far higher than that for compliance spend as a whole (17 percent), reflecting the rapid migration of spend to Regtech from traditional methods. The research found that Know Your Customer (KYC) checks for anti-money laundering are ripe for disruption by AI systems, due to the inefficiency of traditional, paper-based systems. Juniper forecasts that across banking and property sales, annual gross cost savings from AI introduction for KYC will exceed $700 million by 2023 -- that's a nine-fold increase over 2018. "AI-powered ID solutions are uniquely suited to reducing the resources needed to verify identity. By integrating the correct KYC tools into cloud-based systems, financial institutions can dramatically reduce their compliance burden," said Nick Maynard, analyst at Juniper Research. 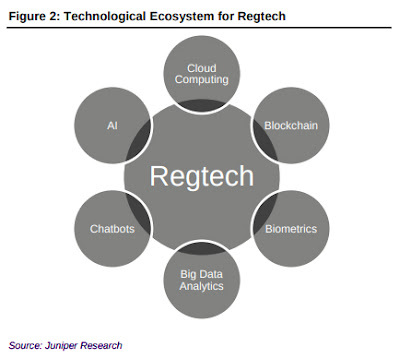 Juniper analyzed various technologies in the Regtech sector based on metrics including anticipated timescale of impact, cost barriers and willingness to adopt new approaches and concluded that cloud computing is currently the most disruptive force in compliance. The transition to cloud-based compliance is a crucial precursor to other Regtech approaches, such as AI or Big Data. Unless businesses effectively plan the correct cloud deployments, they will struggle to utilize the advanced technologies required to meet future compliance challenges.